Hugh Jackman will stop off in the UK and play a few dates in the UK and Ireland as part of his upcoming The Man. The Music. The Show world tour. The star of stage and screen starts his world tour in Spring 2019 with the European leg kicking off at the Barclaycard Arena in Hamburg on May 13th followed by France, Switzerland the UK and Ireland, concluding at The O2 Arena in London on June 2 and 3rd . The 22-date North American leg starts at the Toyota Center in Houston on June 18th and continue across cities including Chicago, Boston, New York, Philadelphia, Washington, D.C., Atlanta, Ga., Las Vegas and more. The final July 19-20 dates are set to take place at the Hollywood Bowl in Los Angeles. 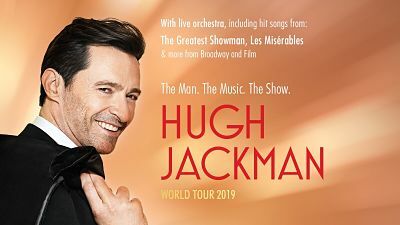 Jackman will appear with a 26-piece orchestra and a crew of singers and dancers He told Playbill This is a dream come true for me. I've done it in Australia but now I'm going around the world. I'm singing I'm dancing I'm telling stories. I'm on the back nine of my life now, and this is about the best parts of the front nine. As for picking his set list, It's really self-indulgent; I do my favorite songsI'm going to sing stuff from The Greatest Showman and Les Mis from stuff I've done on Broadway, Boy From Oz—or stuff that I auditioned for that I didn't get cast for.Although he'll be playing some of the biggest stages in the world, he's going to make it feel intimate. "I think whether it's 300, 3,000 or 13,000 [people], it has to feel like a celebration. You have to connect." Jackman made his UK stage debut as Curly in Trevor Nunn's revival of Oklahoma! in 1998, and was nominated for an Olivier Award for his performance. He is now best known for his roles in The Greatest Showman, X-Men, Logan, the stage adaptation of Les Misérables, Jez Butterworth's The River and A Steady Rain.